Hearthstone Inn & Suites can host your next "MAIN EVENT"! We also offer special accommodation room rates when combined with our Conference Room and catering services for your business (such as retreats) or special event (such as birthdays, reunions, small wedding/wedding parties, celebrations). Meeting room rental/usage and services are available with or without accommodations. We would be delighted to host your small, private-sized wedding or marriage renewal in our Victorian lobby! Over the years we have enjoyed hosting many. Our beautiful lobby is transformed into a small "wedding chapel" and can comfortably seat 20-30 people. Brides typically prepare in a guest room on the second floor, get final details ready for the big moment in our Conference Room, then descend our cherry staircase directly into the lobby where the groom awaits by our Ohio River Rock fireplace. Your ceremony is conducted by your personally-chosen official, vows exchanged, and often there is a reception with your cake and refreshments all in this one lovely setting! Christmas-time weddings are especially delightful with our full, glittering seasonal decor! Hearthstone can provide audio for creating just the right atmosphere, or you can arrange for your own musician. Occasionally the couple stays (as the attendees disperse) following the event, retiring to their convenient Deluxe Jacuzzi King Suite. WEDDINGS: RENTAL RATE (Heritage Lobby): starts at $475.00 (Includes chairs, set-up, tear-down, tables, podium, use of audio system for music). Call us to discuss your wedding details and we'll help you to plan the perfect day! Luncheons (build-your-own sandwich from 2 or 3 meat/cheese options, with soup or salad, dessert and beverage. Prices vary depending on entree and side dishes, dessert and beverage choices. 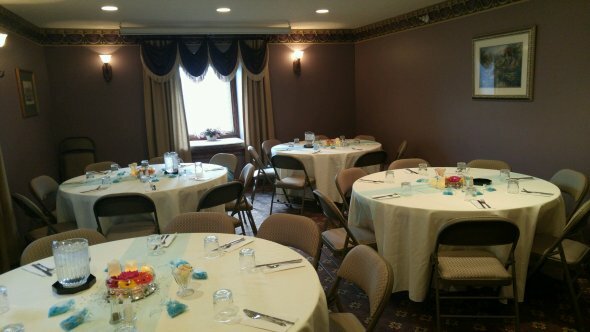 Our banquet/conference room can comfortably seat 35-40 people (classroom-style) or 30-35 people at tables. Special Conference Room room rates are also available, based on the number of rooms/night accommodations your group requires. Breakfast is, of course, included as part of your accommodations package. Room size is approx. 15' wide by 23' long (allowing for additional counter space) and features an elegant plum/sage decor, a service counter and a sink. Refer to the alternating photos above for an example. NOTE: Your event may be self-catered or provided by Hearthstone Inn & Suites. If you need catering recommendations, we are happy to help with that. 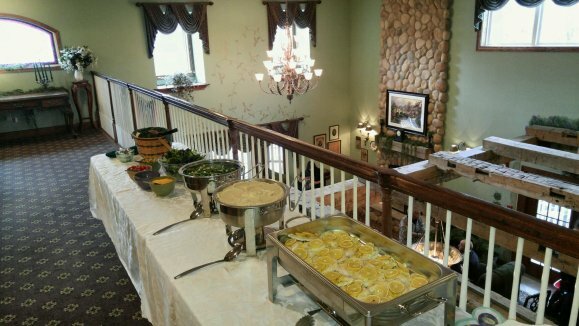 Catering may be done by Hearthstone Inn, an outside vendor, or the by the guest's own arrangements. Above rates include tables (round or rectangle, chairs, tables, and complimentary water/ice service. Tablecloths and additional tables extra. Coffee service is available at $15.00 per carafe of our own freshly ground, custom-blended gourmet coffee. Break-time snacks may be arranged based on your specific needs. Luncheons in-house can be arranged (such as a build-your-own sandwich buffet), or you may elect to dine locally at one of our nearby restaurants. A pull-down projection screen is available in the Conference Room. No charge. China Place Settings (Informal) are available which includes: large plate, salad plate (if applicable), beverage glass, cutlery. A digital projector (which connects to your computer/laptop) is available for rent, $25.00 per day. Your number of guests and event dynamics may affect the type of tables used. Call us at (937) 766-3000 to discuss your needs!